This month I was lucky to attend an event called "Les Sapins De Noël Des Créateurs". It's a charity event which is already popular in France and Belgium and which was now held for the first time in Luxembourg by the Fondation Cancer. 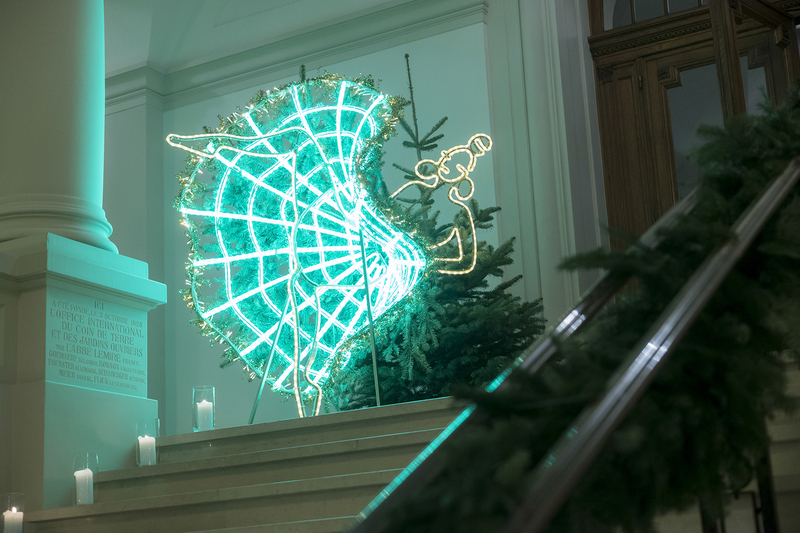 The aim of the event was to raise money for the cancer research, which is why famous and local designers had been creating their modern versions of a Christmas tree. These artworks were sold at the auction that evening. At the end of this post you can see the Christmas trees of well-known designers such as Jean-Paul Gaulthier or Christian Louboutin, and of local designers such as Anne-Marie Herckes or Ezri Kahn. Velvet has been such a huge trend over the last few months but as it's not a very summer friendly cloth, fashionistas all over the world are happy that the colder days are back so they can rock the velvet trend again. I remember wearing velvet a lot on New Year's Eve when I was a child and to me this cloth always gave me an instant festive feeling. That's why I decided to dedicate a whole blog post to velvet clothes and this holiday season I want you to wear it from head to toe to make a fashion statement!